Systems theory is one way to anticipate key issues to bridge the gap between idea and reality, policy and implementation. As a key purpose of this book is to examine access strategies and policies in order to develop positive system level change, there is a need for theoretical interrogation of systems. As a starting point, a key framework is Bronfenbrenner’s (The ecology of human development. Harvard University Press, Cambridge, MA, 1979) well-recognised ecological theory of systems used in developmental, educational and community psychology, where he distinguishes a range of different system level interactions, ranging from microrelations in the immediate setting to meso-, exo- and macrosystem levels. Key strengths in Bronfenbrenner’s (The ecology of human development. Harvard University Press, Cambridge, MA, 1979; Developmental ecology through space and time: a future perspective. In: Moen P, Elder G, Luscher K, Bronfenbrenner U (eds) Examining lives in context: perspectives on the ecology of human development. American Psychological Association, Washington, DC, pp 619–647, 1995) systems focus are discussed. A neglected achievement of Bronfenbrenner (The ecology of human development. Harvard University Press, Cambridge, MA, 1979) was to secure a focus in psychology on background systemic conditions and to develop at least an initial framework for their interrogation; it is a view of the importance of background conditions, not so much as necessary conditions, but as key supportive conditions. This interpretation of Bronfenbrenner through the lens of key silent conditions for causal impact in a system paves the way for the further step of identifying structural indicators to scrutinise specific key system conditions for access to education. The structural indicators may amplify key previously silent system background conditions. Major limitations to Bronfenbrenner’s (The ecology of human development. Harvard University Press, Cambridge, MA, 1979) framework of concentric nested systems of interrelation are discussed in relation to system change. A range of important objections to systems theory, in particular by Jarvis (Globalisation, lifelong learning and the learning society: sociological perspectives. Routledge, London, 2007; Democracy, lifelong learning and the learning society: active citizenship in a late modern age. Routledge, London, 2008), are considered. A more dynamic framework of inclusive systems theory is needed to go beyond Bronfenbrenner; this would not deny that an inert, alienated system tends to render the individual passive within it. A framework of inclusive systems theory for education recognises, like Bronfenbrenner, the potential of reciprocal interaction between an individual and the system and subsystems within which he/she is involved. 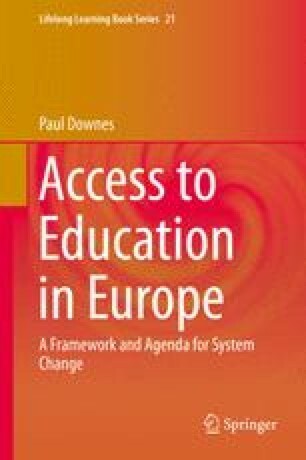 The framework of structural indicators as conditions for change in relation to access to the education system which are being sought to be developed in this book is one avenue towards concretising a systems level approach in practice and for policy.